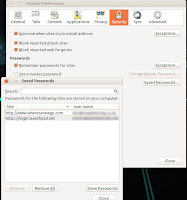 If the password is stored, you can start typing in the first letter(s) of the user id, or you can double-click in the user id text area, either should bring up a choice of user ids. Once the user id is typed in the password will be automatically entered after you have answered request for your master password. The master password needs to be entered only once for a site during your session. If there is only one choice and you have already entered the master password during your session you may be able to just mouse over the user id. You access the Password Manager from the Firefox menu via Edit > Preferences > Security > Saved Passwords. 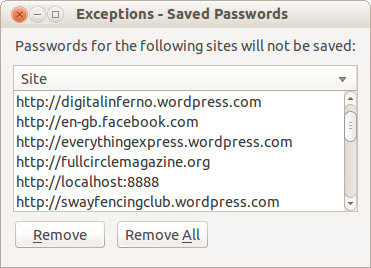 Click the "Saved Passwords" button to open the "Saved Passwords" window. 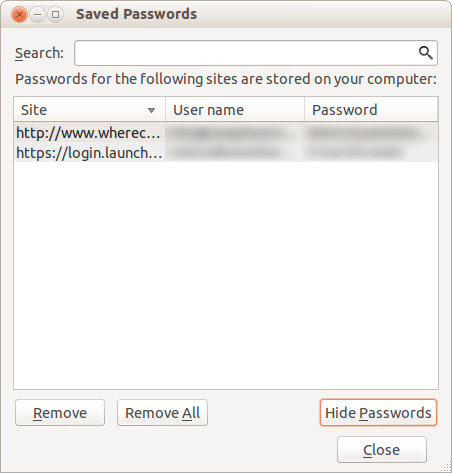 The "Saved Passwords" window lists the web sites and user names for your stored passwords and includes a "Show Passwords" button that lets you view your stored passwords. 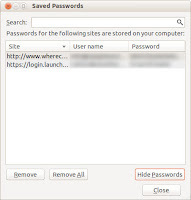 To delete stored passwords for web sites and user names listed in the Password Manager, open the "Saved Passwords" or "Remember Passwords" window (see above). Highlight (select) the items that you want to delete and click the "Remove" button (or press the Delete key). The Exceptions button in Tools -> Options -> Security / Passwords opens a window that lists the web domains from which you chose never to store passwords. If you later decide that you do want to store a password from a site on the Exceptions list, you will need to remove that entry. That is done in the same way you would delete a password, by highlighting the entry and clicking the "Remove" button (or pressing the Delete key).